This short video features the art of Steven Erra, a photographer who is losing his vision due to a retinal degenerative disease, yet is generating beautiful work by light painting. Steven is a member of The Seeing With Photography Collective, a group of sight impaired artists who are making waves in the art world through their imagery and inspiring the work of both sighted and non-sighted photographers alike. There is a short video from National Geographic that is a companion to an article by Ed Yong (@edyong209) in National Geographic here. The photography is wonderful as is typical of National Geographic and is well worth your time. For a more detailed read on the evolution of vision, be sure to check out this Webvision chapter by Trevor Lamb, Evolution of Phototransduction, Vertebrate Photoreceptors and Retina. George RedHawk is a legally blind artist who’s medium is animated gifs and his work is truly stunning. There is a really interesting portfolio of his work on Graphic Art News as well as some background on how he manages to create these amazing works here. In short, he uses photo morphing software to morph one image into another, then he makes animated gifs. Check out his website for more work from his portfolio of on-going works titled “The World Through My Eyes” here. 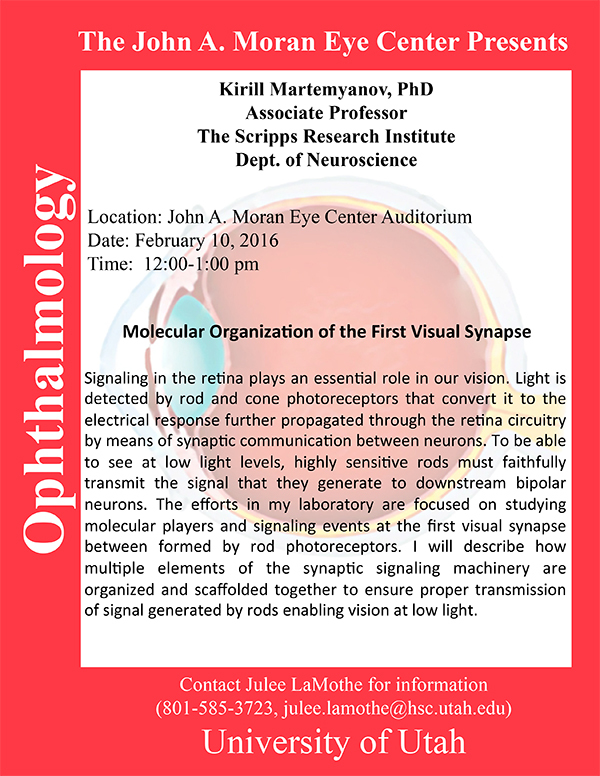 Kirill Martemyanov, Associate Professor at the Scripps Institute will be delivering a seminar on Molecular Organization of the First Visual Synapse, on Wednesday, February 10th at 12pm in the Moran Eye Center auditorium. Abstract: Signaling in the retina plays an essential role in our vision. Light is detected by rod and cone photoreceptors that convert it to the electrical response further propagated through the retina circuitry by means of synaptic communication between neurons. To be able to see at low light levels, highly sensitive rods must faithfully transmit the signal that they generate to downstream bipolar neurons. The efforts in my laboratory are focused on studying molecular players and signaling events at the first visual synapse between formed by rod photoreceptors. I will describe how multiple elements of the synaptic signaling machinery are organized and scaffolded together to ensure proper transmission of signal generated by rods enabling vision at low light.